Sometimes, you gotta kiss a lot of frogs to find your prince. They’re quick and dirty reads – I finished this in under 90 minutes. The top three books on my best-of 2015 list were YA novels. I know there is some great books out there and I don’t want to give up on the genre, because who knows what I might miss? On the other hand, for every Scorpion Rules, Wandering Star or Illuminae there are probably a dozen or more novels like this out there. You know the drill. Chosen Ones, longing over guys with mean-girl girlfriends, adults who serve no purpose but to offer up world building and say “Welp, I don’t know what to do, so you guys take care of this for me, k?”and sibling who exist only to get into danger. Characters in this novel all have their nice to fill. Kate is the by-the-book-timid nice girl. Blake is the hot guy all the girls want. Chris is the nice guy who can’t get the girl (or will probably get the friend down the road). Danielle is the mean girl. Nicole is the wunderkind with all the powers that everyone (except the mean girl, natch) likes. If you’ve read YA for any length of time, you’ve read this book, or at least some variation of it there of. If you enjoy this kind of thing, you’ll love it – it’s face paced and hits all the notes you’d expect it to. If you’re wanting more, keep on looking. I will say that at least this book held my interest enough that I powered through and read the whole thing, so some props there. I was just hoping for a little more. One last note: it appears the author intends to release a quartet of books, with at least the next two having 2016 release dates. The sequel is due out in April. I personally always wonder about release schedules this tight, as it makes me wonder if longer books are being cut up to make more money for the author/publisher. Given how generally underdeveloped this book is, it is something to keep in mind when deciding if you want to pick this series up. Beauty is the key to everything. At least, that’s how it seems to Violet – ugly, bullied, and lonely. To be beautiful, in her eyes, is to have power and love. And when Kendra, the witch, teaches Violet how to use magic, she may finally get what she wants. For Celine, beautiful since birth, her looks have been a hindrance. She discovers that beauty is also a threat – especially to her stepmother, VIolet, who doesn’t want anyone sharing the attention she worked so hard to get and who will do anything to be the fairest of them all. But beauty isn’t only skin deep and love isn’t based on love alone. And though Violet and Celine may seem to be completely opposite, their lives are almost…Mirrored. In my eyes there are two kinds of fairy tale retellings: the super literal kind that hits all the beats in all the expected ways (I felt Cinder fits this model) and then there are kinds like Mirrored: the influences are clearly there and the major beats are hit, but it’s told so well that sometimes you have to remind yourself of what the influence is because the author has done a great enough job that it genuinely feels fresh. You get to this point by making smart choices and knowing how much of the source to use to still feel like the story, but not just ripping it right out of the source. For example of a smart choice: the story starts out by telling Violet’s story. We meet a lonely little girl, neglected by her mother and bullied by her classmates. We see how she makes a friend in a guy named Greg, and how Greg drops her in a hot second after a summer where puberty was kind enough to him to allow him to join the cool kids. Even though Kendra, the witch who teaches her to use her magic, points out that if he had loved her, he’d never have stopped being her friend, Violet doesn’t care. This it the last straw that proves to her that it’s not what inside what counts, only the outside. Kendra teaches her how to change her appearance to help distract her, but it’s by then it’s too late: she’s got this seething hatred for the woman who “steals” her guy and she goes to extreme lengths to get him back (and I’ll just say: this book actually gets impressive dark for a few moments too). It’s that point that the book shifts over to Celine’s point of view. I do have to say that Celine never quite comes off as sympathetic as Violet did (before she went crazy anyway): it’s just hard to believe that someone so drop dead gorgeous would really have that much trouble finding a group of friends. She’s smart, but not a total book worm, and she’s still pretty, and in our society, pretty will get you into a lot of doors. Regardless, Celine is likable, she is sympathetic, and you do want her to get the heck out of dodge as soon as you can, so brava there. And then his leads to my second point of knowing how much source material to use: there are no seven dwarves. There is a family of seven people that happens to have some some little people in it in it, including our main male character Goose. Our “Prince” of the tale is a Justin Bieber analogue named Jonah Prince (and yes, the story goes for the technicality, but because of how it’s set up and the ending, it all totally works). Flinn even has the sense to subvert the ending of the tale which I am super glad for and was completely the right decision. 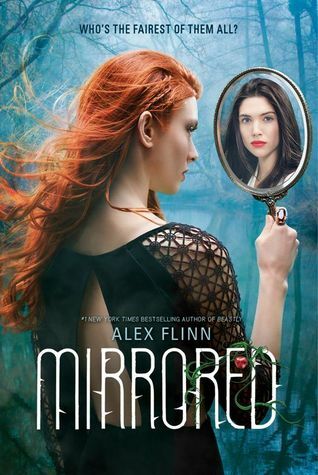 All told, Mirrored is a very enjoyable retelling and anyone who enjoys genre YA (fans or otherwise of retellings) should enjoy this book. It came out yesterday, so give it a look! So I decided to join up this cool (not-so-little) cheer/secret santa exchange called #otspsecretsister. Seeing that I’m a fan of Urban Fantasy, my sister included this book as part of her first package to me. She wanted to share it because it is a series she loves, and she even went so far as to annotate the book with notes, a genuinely thoughtful touch! So what was my reaction? I wish I liked it more. To be sure, the premise is cool: the dead rose, and when the government and conventional faith could not resolve the crisis, the Church of Real Truth stepped in and took over. The Church is basically an atheistic organization that can weild magic and encourages its use while tamping down on various religions. While I do wish it had been more fleshed out, we got plenty to give the world a unique setting of its own. I also like that the creatures du jour are ghosts. As I’ve said before, I love me some vampires, but it is fun to mix it up. But that’s about all I liked. Meet Chess: She’s a drug addict and that’s about it. She has no other defining characteristics and we learn little else about her during our stay in her world, other than she was an orphan. Honestly, her drug use seems quirky more than anything and that bothers me. Drug use isn’t quirky. It’s debilitating. For as little as it impacts her, she might as well be smoking weed but she’s clearly doing some really duty stuff. And these drugs seem to have zero impact on her on. She’s not eating, she’s barely sleeping and no one notices that anything wrong? Like at all? She’s so high-functioning she might as well be sober. It ultimately adds nothing to the story – seriously, you could replace her drug addiction with a gambling one and it would have the same impact on her and on the story. That’s not a good thing. What’s worse, is that if you take away that part of her, there’s nothing left to define her. Addiction isn’t a quirk nor is it a character trait. Ultimately Kane just seems to use it as a lazy way to develop character and it did not work for me. Beyond that, this book is unquestionably story (and not character) driven. I need the emotional investment to hold my interest, so the story just didn’t work for me. It was there. It was adequate, but it wasn’t anything particularly memorable or unique. While I can see why a series like this would make it to series and why it has lasted as long (#6 is going to be released next year after a few year hiatus) it’s just not a series for me. Maybe if you like ghosts and don’t mind more plot driven stories it’d still be worth a look. 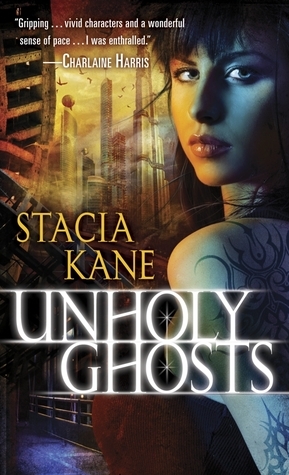 I just personally think there are better Urban Fantasy series out there to recommend it.